With reference to the Thomas Bradshaw photos I sent to you. We have had some success in linking my grandmother’s family (Robinson) with the Bradshaws. Isaac Robinson born in Baydon Wiltshire near Swindon is the link. Isaac born in 1856 is shown in the 1891 census as living South View Villas Heston and employed as labourer for a flour miller. In 1900 he marries Sarah Alice Bradshaw born 1860, daughter of Thomas Bradshaw. In the 1901 he is living at 71 Windmill Road Brentford and shown as a Manager of a Corn Stores and listed as a worker. 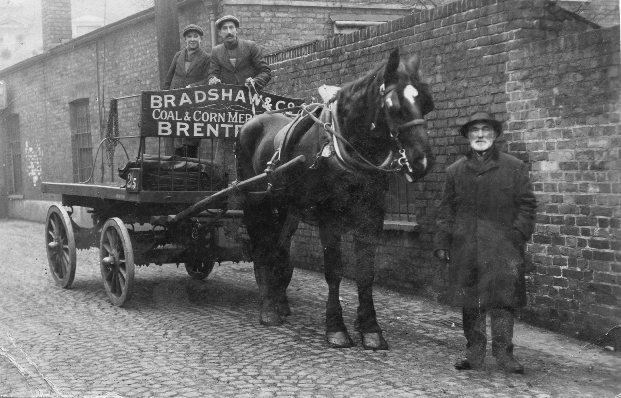 In 1911 he is a Corn & Coal Dealer living at 119 High Street New Brentford. 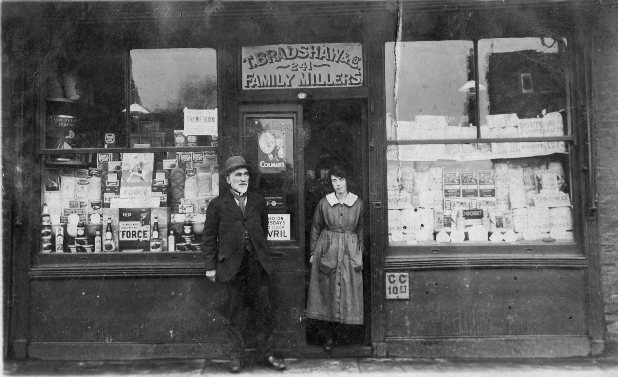 He is running Bradshaw & Co his wife’s business, Thomas Bradshaw having died in 1898. At some time between 1914 and 1926 the business moved to 241 High Street. In 1926 Isaac dies, and Sarah Alice Robinson (Bradshaw) continues to live at 241 until she dies in 1937. Her estate goes to a Frederick Robinson. This may be when the business closed as it was still operating in 1933. Thomas Bradshaw, corn merchant, was at no. 241 High Street in 1926 and 1933 directories. In a 1913 directory T. Bradshaw, corn merchant, was at 119 High Street and a Thomas Bradshaw, baker was at no. 119 for at least 40 years (1851 - 1891). From the details provided by Betty the white-haired, bearded gentleman who appears in both photos may be Isaac Bradshaw. The following goods were displayed in the window: Scott's Porage Oats, Spratts Dog Cakes and Fish Flavour Meal, Osoko, Colman's, Force 'The whole wheat (something) with malt', Old Dutch Cleanser and Bovril. There is a note posted in the window 'Christmas Holidays'. The second photo may have been taken in the access to no. 241 from Albany Road.